NASA’s asteroid-sampling OSIRIS-REx spacecraft, as seen by the Large Binocular Telescope in Arizona on Sept. 2, 2017, when the probe was about 7 million miles (12 million kilometers) from Earth. 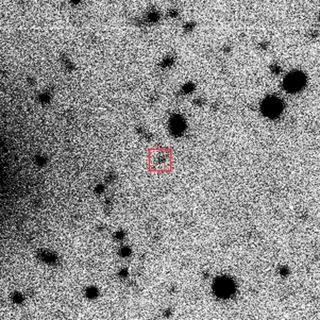 A telescope has captured the first views of NASA's asteroid-sampling OSIRIS-REx spacecraft since the probe launched a year ago. The Large Binocular Telescope Observatory (LBTO) in Arizona snapped a series of photos of OSIRIS-REx, which is headed toward Earth for a Sept. 23 flyby designed to slingshot the craft toward the asteroid Bennu. The Large Binocular Telescope in Arizona captured these views of NASA's OSIRIS-REx asteroid-sampling spacecraft on Sept. 2, 2017, when the probe was about 7 million miles (12 million kilometers) from Earth. OSIRIS-REx is approaching our planet for a planned Sept. 23 flyby that’s designed to slingshot it toward the asteroid Bennu. The $800 million OSIRIS-REx (short for Origins Spectral Interpretation Resource Identification Security Regolith Explorer) mission lifted off on Sept. 8, 2016. If all goes according to plan, the probe will rendezvous with the 1,640-foot-wide (500 meters) near-Earth asteroid Bennu in August 2018, study the space rock from orbit for two years, and then go in to snag at least 2.1 ounces (60 grams) of material. This dirt and gravel will come down to Earth in September 2023, aboard a special return capsule that OSIRIS-REx is toting. Scientists around the world will then study this sample, hunting for organic molecules — the carbon-based building blocks of life as we know it. It's perhaps fitting that LBTO captured these first images of OSIRIS-REx's flyby homecoming; the mission's principal investigator, Dante Lauretta, is based in Arizona as well, at the University of Arizona's Lunar and Planetary Laboratory. There will be more views of OSIRIS-REx to come, as the spacecraft gets closer and closer to Earth ahead of the Sept. 23 flyby. Indeed, NASA and the mission team are inviting the public to submit photos they snap of OSIRIS-REx over the next few weeks. To learn more, go to http://www.asteroidmission.org/upload-spacecraft-imagery/.